You can try it on a phone, tablet, or PC with Windows 8.1 or Windows 10. Menu screens were redesigned for larger displays. The user interface of the map is also slightly different from the Android or WinCE version. This version contains only free OSM maps (not TomTom maps) and uses the older software renderer (not the new GLES). Download blocked! The firewall reports that this file included a virus or maleware! It seems that Firefox is blocking the download. Try to download it with Internet Explorer. There is no virus inside, it is an instalation file of a Windows Store app. Now I have installed Mapfactor Navigator, but I can't find to activate GPS. My System is Windows 10 and I have a Blutooth GPS-Maus. Can I insert my own POIs? Where can I find the Installfolder? Can I use the maps from MapFactor Navigator Free? The long "MapFactor" folder might have a different name, but at least one folder with the "MapFactor" name should be there. You can copy OSM maps from Navigator Free here (at least Android maps work), your favorite places etc. I think that custom POIs / custom categories will not work in the app yet (you can try it). For the bluetooth GPS - it's exactly why we need to test this app right now! It seems that some bluetooth GPS receivers work in desktop apps (PC Navigator FREE), but not in Windows Store apps. If you have an incompatible sensor, you need to use some "GPS sharing" app, for example GPSComplete. Can you try, for example, built-in Windows Store Bing maps? Does GPS work here? own POIs (created with digger11 or digger12) Mapfactor closed the Program without Comment. the button left above "Settings" shows me, that GPS-Konfigiration is grey. How can I insert a picture? Can I write in German? Let's start discussing the main user interface changes in this Windows 8.1 / Windows Phone version. Map view has been simplified. There are no gradients, numbers are white on a black background. The time is shown as a "3 min", rather than "00:00:03". The next manoeuvre is displayed at the top, with a small icon. It is shown only 5 km and less before the intersection, otherwise is hidden. Map mode button was divided into two buttons. The right one switches between the "north up" and a "compass view". 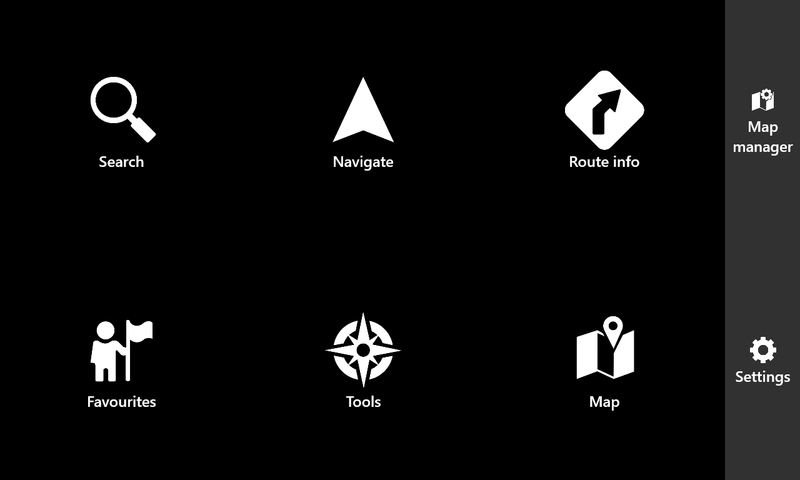 The compass icon is animated and always shows the direction of the map. The left button means to "center the view". It is shown only when user has moved with the map. These two buttons work similarly in a navigation mode. The right button switches between the 3D view / north up / compass mode / and show whole route. Left button starts auto-centering (because you can move with the map even in a 3D driver mode, or with an active compass). During navigation (with the compass mode selected) the map is rotated by the compass only when the speed is < 5 km/h. At faster speeds the map is oriented by the direction you are traveling (azimuth). Zoom buttons can be hidden in the settings, or you can set a Menu button here. Map autozoom works differently for < 60 km/h (closer view) and > 60 km/h (more zoomed out view). Map labels are slightly bigger, one-way arrows are filled with color. Zoom levels of map elements and POIs have been also modified (mostly, you will not see all parking spots in the entire city now, only in a closer view). 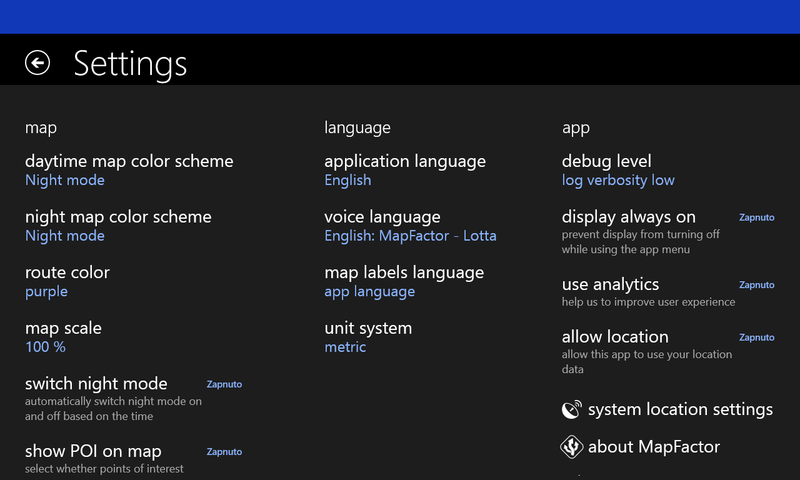 Application flow is also a little different in the Windows Phone / Windows 8.1 version. Each screen has it's own vibrant color. Everything search related is green, favourite routes and places are yellow, route info and itinerary screens are violet. When you select an address and click on "set as start" or "set as waypoint", you are redirected onto Route info screen (not on the map, compared to Android version). You see your route points here, you can click on Show on map (to calculate and display the route) or on the Navigate button (to start navigation). You can also add a new point to the route from here (it will redirect you back to the Search screen). Other useful items are located in the bottom menu (start simulation of the route, reverse / optimize route... these items have been moved here from the Tools screen). You can also add route points from the map. At this case, when you add a new point as a waypoint, you are not redirected onto Route info screen, but directly back to map (and the navigation route / itinerary is recalculated automatically). 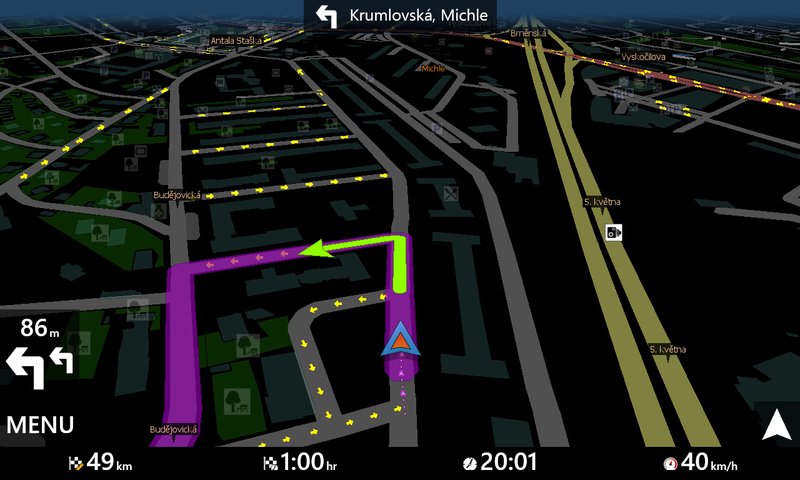 You can even add new waypoints from the map during navigation (2D or 3D driver mode). So, what do you think about these modifications? Which ones should we implement into Android version? I'd be happy to test this but when running Add-AppDevPackage with powershell it opens and closes empty powershell window in finite loop. Did you unzip all files from the archive to the folder? You can also try to run this PowerShell script as an administrator, it could help. I appreciate that you ask whether options should be carried forward to Android as well, being an Android user, but I don't have a windows phone and neither a windows 8/10 laptop. It is a bit difficult to judge when you don't have a "hands on" experience. However: the (probaby windows) theme of white characters on a black background, as displayed above, always gives me instant headaches. For me that would be an absolute NoGo. I assume that black (or dark) characters on a white background is also possible? With regard to the top image where you mention: "The next manoeuvre is displayed at the top, with a small icon." I still see the double arrows at the bottom-left of the screen. Is that a left over or ..? You also mention: "When you select an address and click on "set as start" or "set as waypoint", you are redirected onto Route info screen (not on the map, compared to Android version). You see your route points here, you can click on Show on map (to calculate and display the route) or on the Navigate button (to start navigation)." I'm not sure whether I like that, also because I can't test. When you go to the map, like now in Android, you have an immediate visible check whether the departure/destination/waypoint is where you expect it to be. When you are taken to the route info screen, you don't see that. The last point about adding a waypoint directly from the map is nice, but is already implemented in the Android version: you tap on the map, get the "option bar" on the right side of the screen, and when selecting waypoint, the waypoint is added to the route and you are back on the map. So is that not in Windows yet, or am I misunderstanding you? Edit: The last option is also contradictary in workflow to the previous "functionality" where you are taken to the route info or search screen. That is not a consistent workflow. In practice it might work very well, but again: I can't test. Windows Phone version has also a white theme, it's selected automatically by the system phone settings. More white screenshots can be found in this article. Windows version has only a black theme at this moment, but we can implement it. The manoeuvre panel with two arrows is still displayed always at the left bottom. The upper label is shown only 5km and less before the manoeuvre. Yes, it is a duplication of the information, but we had very positive responses from drivers, on this new layout. Of course, we can still tweak it a little. You can click on "Show on map" from the search result dialog (to view the point on the map). Then you can go back and select Navigate or Set as waypoint. 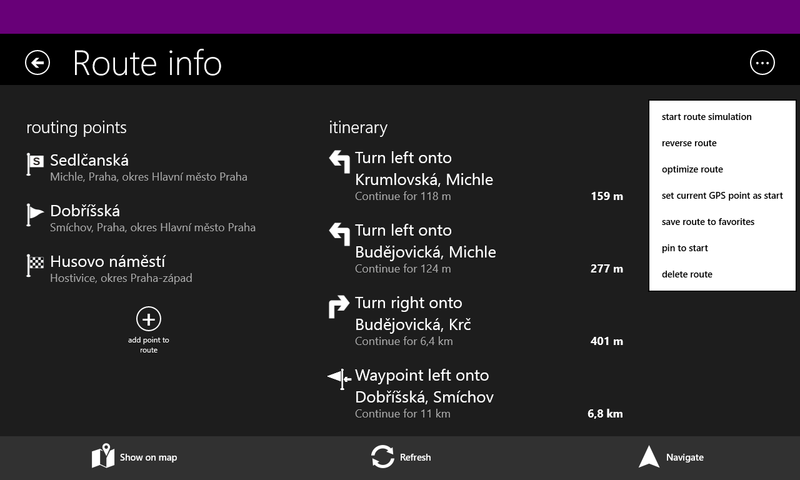 Or you can directly start a navigation from here. The aim was to simplify the flow a little, Android has two or more similar dialogs when you want to start a navigation. Adding a point from the map - yes, it is very similar to Android version. 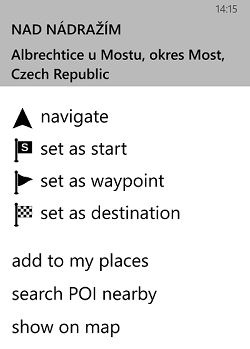 Difference is that Windows Phone has only one button, this button redirects back on the Search result screen. Android version has a smaller panel (with a list of tiny icons), with all the features listed separately (again - it is a different interface for the same thing). Eventually I managed to install this. I think this is good developement, and I'm glad you're taking this forward. Locationing works good. New interface with sharp, large resolution is also nice. - Day/Night -mode doesn't change at all. - Map downloader doesn't work, when clicking "Europe" option, the program freezes completely. - My POIs crashed the software, it didn't even start up with them (works with PC Navigator). - Favourites inside folders/groups dind't show up. - Finnish language wasn't included. - Automatic Day/night -mode changing, using luminosity meter if possible. - Possibility to change interface size (Bigger buttons, info panes and so on). - Possibility to change interface colours. As I'm curious, what is the roadmap with this? I guess at least the drawbacks I encountered are just with current betaish release. I like the autozoom based on speed and have requested this on previous versions of the android app. anttiai: Can you please send us log files from the app? They are saved in a /navigator/logs folder. We will look at the Map downloader problem. Day/night button should work, but it has (maybe) an incorrect naming. It should mean "turn on changing day/night themes automatically based on time", not "switch to night theme immediately". We will look at the problem with custom POIs and favorites. Yes I can send them - but where? It seems that I skipped the instructions, it was quite clearly mentioned that it is automatic :) Will it be possible to set the time by yourself? The darker map does seem good. I also noticed that there is slight lag when searching for address. If you write the address quickly, the software starts lagging with character input. Will there be an internet search for the addresses? I will take this into test tomorrow morning and I'll report if any glitches occur. When I left-click on the map, the black square mark is shown, but at the wrong position: when the click position is at x / y, the mark is at 1.4x / 1.4 y. This only happens, when the notebook display is set to the normal resolution of 1920 x 1080. At lower resolutions, e.g. 1600 x 900, it's OK. Most of customers has left-drive cars and phone mostly seats in holder at right side. So phone's holder can overlap left bottom part of screen, exact that which holds direction arrows. It's reasonable to allow user to set place of directional arrows to top part of the screen. Creating an route with points calculates it's correctly until app's restarted. After the app started again it displays transitional points on the screen but navigates to very finish one. There is no Belorussian interface. Can you please add it to Crowdin, I am about to spent some hours to make Belorussian translation. Routing engine proposed to drive thru entry city where speed limits are set to 60km/h or less and doesn't calculates time that possibly will spent on crossings with signals while there is route with signal-less motorway and allowed speed of 90-100 km/h in 90% of the route that takes only 1 minute longer than one via a city center. Thanks a lot for your hard work and waiting for a new release (with the exit button/menu item and customizable (unencrypted) POI file support). 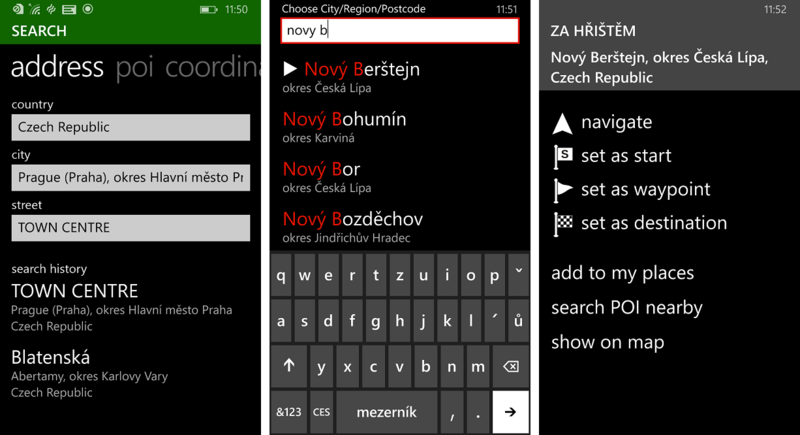 I added Belorussian language for translation to the crowdin interface. can I download the app beside the windows store? Thanks, I've started to translate. My business Android phone (my only phone) is in repair for 2-3 weeks. I'm currently on a business spare windows phone and decided to test MNF immediately. - How do I import my favorites? - How do I import my own color schemes? is there a registered uri protocol for the windows store version, so address links can be opened with it? I've tried all of them, BINGMAPS:, MAPS:, etc. With theme/screen background set to white, the characters on the road sign become black.. This makes it almost unreadable in Night mode and very hard to read in day mode. I expect it does not support NMEA COM GPS? No chance of adding such support?.. Also, the app is super-laggy compared to PC Navigator 15 FREE. Map scrolling on my Core M 5Y71 tablet feels like 2 fps. What else... Map download screen is poorly designed, all data in top left corner and a lot of empty space everywhere else. I use 150% UI scale in Windows settings if it matters, screen is 10.9" (Dell Venue 11 Pro 7140). How do I search for a POI? Assuming now that there is no possibility I have some options to display a POI. But when I'm in a big city and want to go to a specific restaurant and I don't know where it is, I have no option to search. I get a list of about 300 restaurants/pubs etc. and have to scroll through the whole list. If I search for a McDonalds (I don't but everyone knows that one :) ) I need to sort the long list on name and go to Mc. Please make it like the android version especially when you can't exactly remember the name you can type in "something" and try a few times in Android. On windows phone that's not possible. - In Android you can nest the favorites in folders. Will that be implemented? - GPX (NMEA) tracking of your travel. Will that be implemented? - TTS: Will that be implemented? 3x times "yes" would be nice :), but please also give some planned/estimated release date/period in case of "yes". thanks, this is a good outlook! When overspeeding you get a flashing speed sign warning. Say if you go from 130 kmh to 120 kmh motorway, or 120 kmh to 100 kmh motorway and you don't slow down fast enough, you get a warning signal, but it's not a speedsign indicating the correct speed but always the 50 kmh speed sign. At first this is really confusing. However, it stays annoying and confusing as you always have to check whether it really is 50kmh (for whatever reason) or a "false" warning (because of a parallel or crossing road (viaduct). This distracts you from traffic. In this post I asked how to import my favorites and color schemes. @Lubos answered that that is not (yet) possible but he pointed me to a tool. All data for all apps resides in the hidden and closed folder "WPSystem". It is now possible to access that with any file manager. I'm testing on two devices, Lumia 535 and BLU WinHD, both w/ WP8.1 and so far so good. The core funcionality as GPS app is superb and personally, I like the UI better than Android version. Thanks to MapFactor team for a fine app!! - The interface and map view feel kinda sluggish, is it because of (beta) SW renderer? Today I tested MF on Lollipop & WP8.1 (people looked funny at me, who the h*ck carries 2 phones on the dashboard?? :D), both freshly installed and no settings modified at all, on a ~30Km city route with many checkpoints. Both phones gave me different routes, on WP it was pretty straightforward while on Android seemed more convoluted, but still okay. How can I download this new version for Windows 10 without going through the Microsoft store and using a Microsoft account? What you say may be correct for Windows Phone, but certainly not for Windows 10 on a laptop, where you can install anything if you could provide it outside of the Microsoft store. Hoping this will not be the end of PC-Navigator, because i dont use Windows Store Apps and i have actually no access to the windows store - maybe because i disabled services which needed for the store or because i dont have a microsoft account. OS is Windows 8.1 64. Also when i use Windows 10 - same problem.